Pet safety. That phrase tends to bring to mind first-aid kits, training a good recall so your dog doesn’t run out into traffic, even collars and leashes that can’t be breached. But for some reason, many owners who are otherwise sophisticated about canine health and welfare issues ignore the importance of securing their dogs in a car. The safety benefits of car restraints for humans are no longer in dispute: 49 of 50 U.S. states have seat belt laws, and the same number of states require additional restraints for children — for example, rear-facing infant seats or child booster seats. Yet people who wouldn’t dream of driving their kids around without buckling them in have a blind spot when it comes to their dogs. Harnesses? Crates? Booster seats? No way. Luckily, there are businesses like www.PetAutoSafety.com and the affiliated product test blog to help people make smart choices. The creator of the sites, Dawn Ross, talked with Animal Cafe. Dawn, a certified dog trainer, rescuer and shelter volunteer — among other animal-related positions — started her pet auto safety business in 2006, when even fewer people were aware of the need to secure a dog in a car than they are now. She started using seat belts to travel with her own three dogs and, upon doing some research, found a lot of really good companies that produced pet auto safety products. 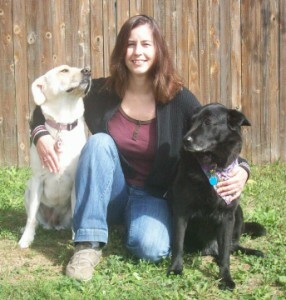 An idea for a business that would inspire her by helping others and working with dogs was born. 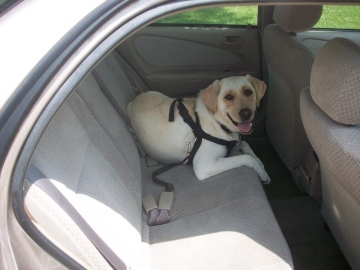 Even if, as Dawn points out, you labor under the delusion that you are somehow impeding your dog’s freedom to enjoy a car ride when you apply any kind of restraint, consider that there is also a safety issue for the driver and the car’s other passengers. At 30 miles per hour, a dog that weighs 80 pound will have an impact equal to 2,000 pounds if there is a sudden stop. And all kinds of accidents can occur when you’re distracted by your dog roaming around or trying to get into your lap. Like other businesses that want to succeed, reputable pet companies have to guarantee their products’ effectiveness. In the case of auto safety products, this involves strength testing and crash testing. In addition, a great variety of items beyond seat belts are now available, although seat belts — along with secured crates — remain the most popular form of restraint. On PetAutoSafetyBlog.com, Dawn and her team of canine testers try out various products, discussing — well, Dawn does the discussing — the cons as well as the pros of each of them. 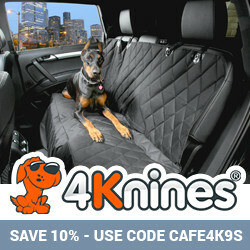 Here, for example, is a review of Outward Hound’s Pet Car Barrier. I asked Dawn to suggest some of her favorite companies, and she mentioned some that not only did a lot of testing but that have been around long enough to be able to amortize the high cost of those tests and lower their prices. You’re going to have to listen to the interview to find out which companies those are. *I’m very sorry to report that, when I checked Dawn’s blog to find some examples of pet safety tests that her dogs were involved with, I learned that Sephi, the ten-year-old Chow/Shepherd/Labrador/Border Collie mix on the right in the first picture posted here, was released from her pain a few days ago. Good-bye to a beloved dog, and one who played an important role on this earth by helping others pups to ride safely with their people. This entry was posted in Edie Jarolim, Pet Travel and tagged Pet Auto Safety, Pet Auto Safety Products on November 7, 2011 by Edie Jarolim. Aside from knowing you from Will My Dog Hate Me blog,I also know Dawn (small world! ), who introduced me to the Bergan dog car harnesses which are safety strength tested. My dog now wears the Bergan and I have with Dawn's help imported them into the UK for my customers, these are the only brand of dog car harness I recommend, as in the UK we have no other safety tested brand available. Keep up the good work spreading this important message for the need to use dog seat belts or similar pet auto safety restraint devices for safe car travel with dogs.